Asif, M., Singh, A., Bilkanti, L. (2013). In-vivo Anticonvulsant and In-vitro Antitubercular Activity of methyl Indole Derivative of some 6-aryl-4, 5-Dihydropyridazin-3(2H)-ones and their Expected Anticonvulsant Mechanisms. Iranian Journal of Pharmaceutical Sciences, 9(1), 67-80. Mohammad Asif; Anita Singh; Lakshmayya Bilkanti. "In-vivo Anticonvulsant and In-vitro Antitubercular Activity of methyl Indole Derivative of some 6-aryl-4, 5-Dihydropyridazin-3(2H)-ones and their Expected Anticonvulsant Mechanisms". 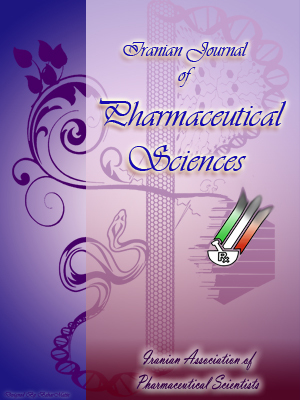 Iranian Journal of Pharmaceutical Sciences, 9, 1, 2013, 67-80. Asif, M., Singh, A., Bilkanti, L. (2013). 'In-vivo Anticonvulsant and In-vitro Antitubercular Activity of methyl Indole Derivative of some 6-aryl-4, 5-Dihydropyridazin-3(2H)-ones and their Expected Anticonvulsant Mechanisms', Iranian Journal of Pharmaceutical Sciences, 9(1), pp. 67-80. Asif, M., Singh, A., Bilkanti, L. In-vivo Anticonvulsant and In-vitro Antitubercular Activity of methyl Indole Derivative of some 6-aryl-4, 5-Dihydropyridazin-3(2H)-ones and their Expected Anticonvulsant Mechanisms. Iranian Journal of Pharmaceutical Sciences, 2013; 9(1): 67-80. Methyl indole derivative of some 6-aryl-4,5-dihydropyridazin-3(2H)-ones (3a-e) were synthesized by Mannich reaction and evaluated as anticonvulsant against MES (50mA, for 2sec), INH (250mg/kg), scPTZ (80mg/kg) and STR (3mg/kg) induced convulsion methods at 50 mg/kg dose level. All compounds 3a-e were also evaluated as antitubercular agent against M. tuberculosis H37Rv by MABA method. All compounds 3a-e were showed anticonvulsant activities against MES, INH and scPTZ-induced convulsions methods but no compounds were active against STR-induced method. Compound 3b, compound 3d and 3e were showed highest protection against MES, INH and scPTZ-induced convulsion models respectively. Compound 3d was showed highest antitubercular activity, with 12.5µg/ml MIC value. Previous data reported the pyridazinones are the important biological compounds which possess almost all types of biological activities due to this reason we synthesized some pyridazinone compounds and characterized by spectral analysis. Results indicated that title compounds were showed moderate to good anticonvulsant activities but less antitubercular activity.